Until 2007, the only creatures able to experience the sensation of floating effortlessly above the colorful walls of the Grand Canyon were its native eagles. 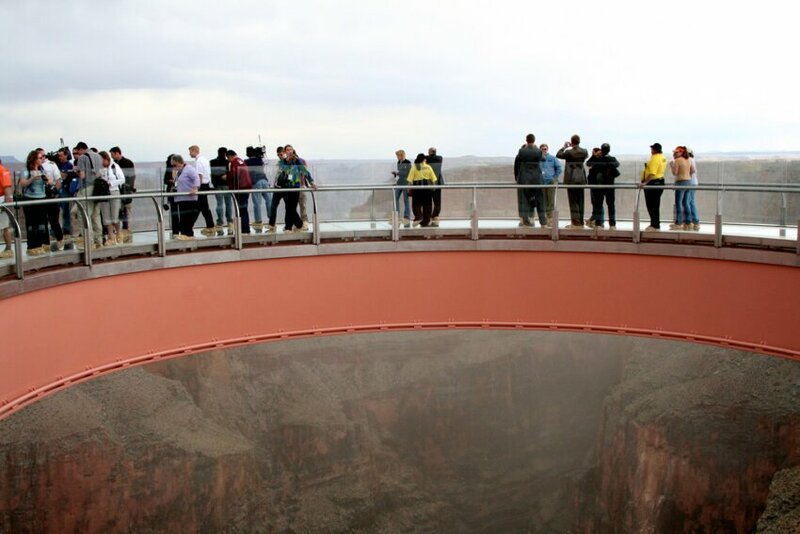 But with the opening of the Grand Canyon Skywalk in March 2007, tourists from all over the world were able to have that amazing feeling — and you can, too. 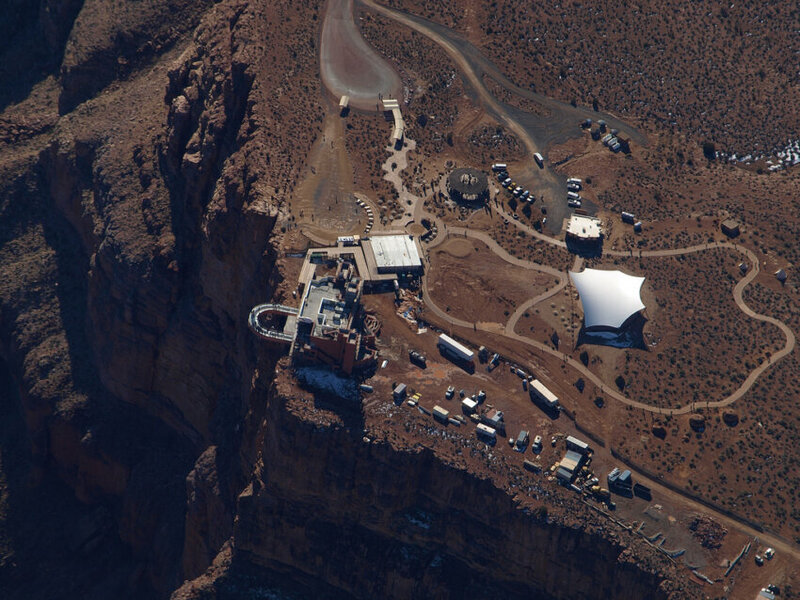 The Grand Canyon Skywalk is owned and operated by the Hualapai Indians, and it’s located on Hualapai land, outside of Grand Canyon National Park. This astonishing cantilevered bridge is a marvel of engineering as well as a breathtaking experience. From start to finish, the Skywalk was a daunting task. Every piece of equipment and every nut and bolt was transported by truck over bumpy unpaved roads to a site with no power and no water. And the bridge’s design had to provide a clear, unobstructed view of the canyon below while remaining structurally sound and environmentally safe. The walkway is anchored to the cliff with 40-foot welded beams sunk deep into the rock without cutting into the cliff face. It contains 900 pounds of glass panels, and weighs over a million pounds in total. Because of its size and weight, the bridge was built first, and then moved into position overlooking the canyon with a complex system of padded steel bars and counterweights. 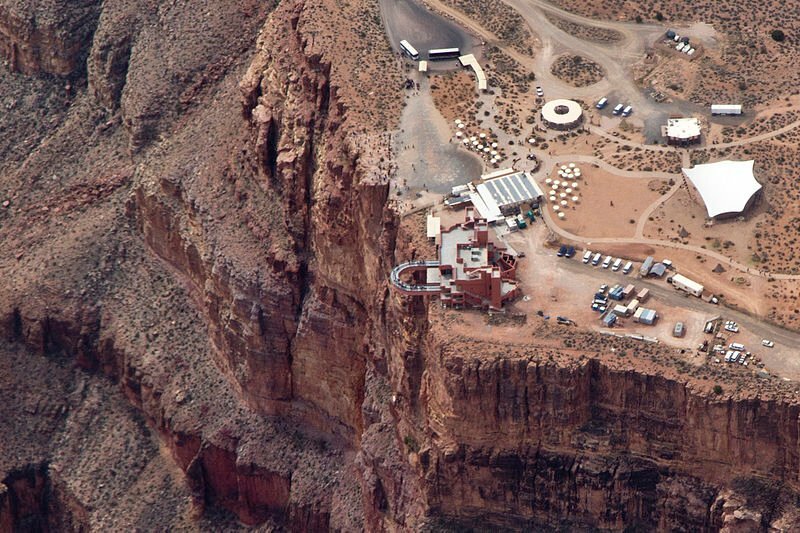 From a height of 4000 feet above the canyon floor, visitors are standing higher than the top floor of the world’s tallest skyscraper — so it’s no surprise that many people initially feel a bit of vertigo. 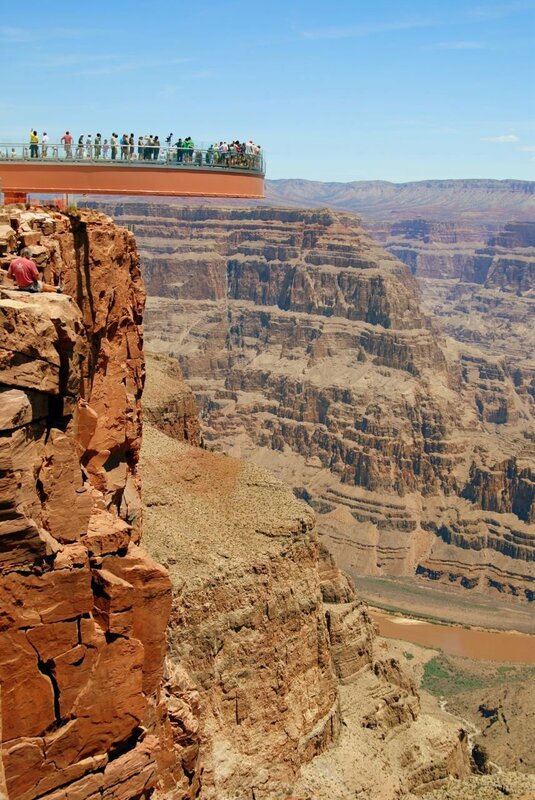 The clear glass floor allows a perfect view of the canyon below, and provides the illusion of floating or flying. 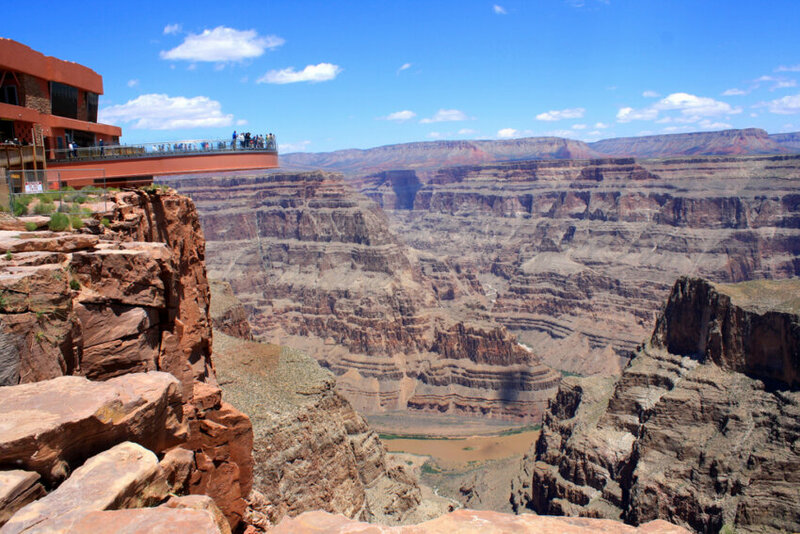 It’s truly the ultimate way to view the magnificent vistas of Grand Canyon West. Visitors to the Skywalk are asked to leave cameras and cellphones at the entrance, and are issued protective shoe coverings to keep the glass floor unscratched. 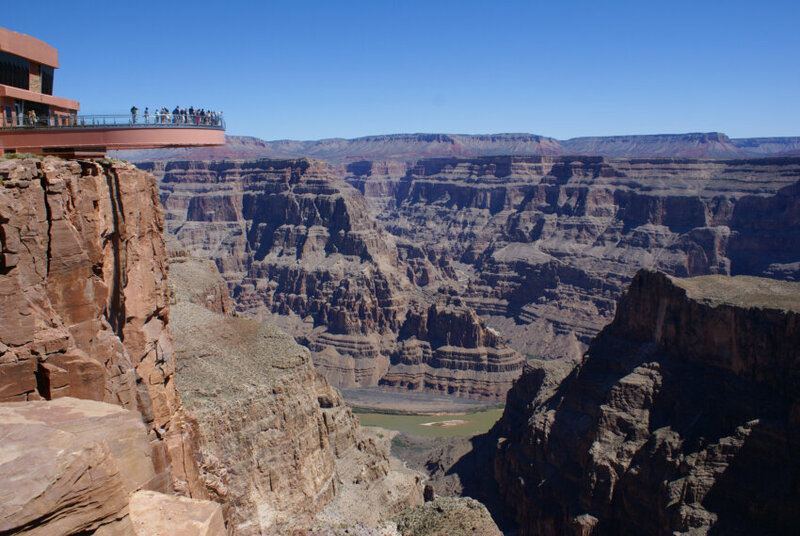 The Grand Canyon Skywalk can be reached via a number of different tours or by making reservations directly with the Hualapai Nation.